Marketing is the set of activities that attempt to influence choice, whenever an individual or organization has a choice to make. They are the chances at getting and keeping customers. Customer Orientation Approach: Customers do not buy products. They buy benefits that the product features provide. 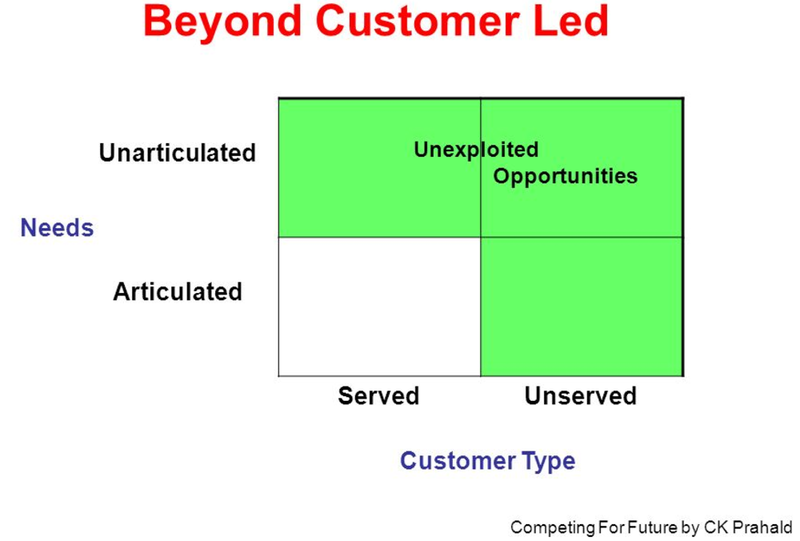 Gary Hamel, CK Prahlad: Competing for Future - For a company to dominate in the future, it must lead the customer rather than being customer led. Most of today's business comes from customers who are currently being served by product which are developed based on the needs that be clearly articulated through customer research. Whereas 2/3 of opportunity lies in areas that customers cannot conceptualize well and that are open to competitors with more foresight. Marketing concept is not limited to current, expressed needs. The 3C’s model points out that a strategist should focus on three key factors for success. In the construction of a business strategy, three main players must be taken into account. Only by integrating these three, a sustained competitive advantage can exist. Preferred path: Start as a "? 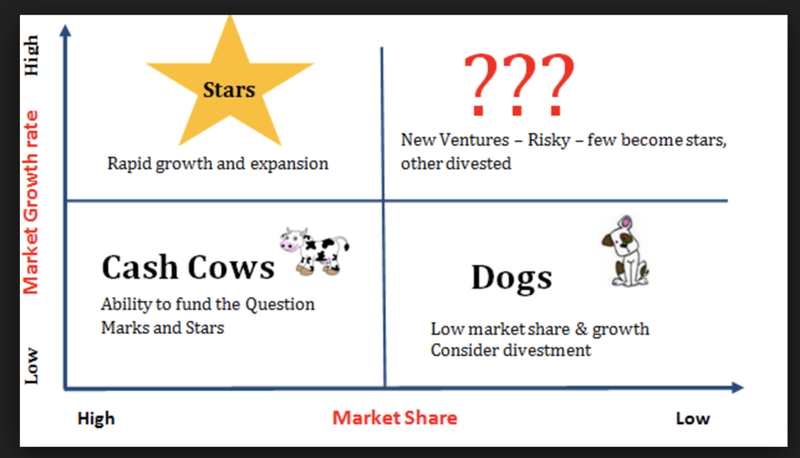 ", gain market share to become a "Star", maintain and defend your position as a "Cash Cow" while the market growth slows. And look to constantly divest your dogs. Best scenario, find a cash cow, and use it to fund "?" that becomes a star. Developing new and emerging products "?" What decision do we need to make? Observations - Read Paco Underhill. Doesn't answer Why? Experiments- Hypothesis based. test 1 thing. Surveys - Keep it short. 1-2 q over several times. 1 to 7 point scale. Soured from published govt sources (Census, dept of Commerce etc), Consulting firms, research agencies, Competitors (websites, ads, catalogs), Trade Journals etc. But always start within the company. Sales, finance, prod dev have wealth of information. What is the Value of Market Share (VMS)? The long run VMS to any company is company specific and is a function of - Size of market, Growth of market and the profit margin on each product (unique to each company). Example: VMS for Toyota in the car market is 2.5X more than Ford and GM since it generates majority of its margins from the car market. Unlike Ford, GM which value Trucks much more. What is the Cost of Market Share (CMS)? How much are you willing to spend to maintain a certain market share. According to Cook, In steady state, Market share is proportional to effort (share of marketing investment). If a competitor responds aggressively, CMS increases for everyone in that market. As competition decreases their investment, cost of gaining market share also decreases. Every marketing plan starts with a segmentation. The choice of customer dictates everything that follows. Segmentation is all bout focus and better understanding your customers. It is an artificial construct created by companies to better develop and sell a product. Customer Segmentation - Who are the customers? Loyalty - leads to repeat purchases, referral/ recommendations to others, feedback, less price sensitivity, more tolerant to firms mistakes). Loyalty has to be earned through customer experience and service. Usage groups - 80/20 Rule - 20% of users consume 80% of products/services. 4Ps should be different for each segment. E.g. volume discounts, larger and easier packaging, mass distribution - grocery stores, home delivery etc for heavy users. What are the benefits from Customer Segmentation? B2B customer segmentation is similar to Retail customers. Brand, is a promise for a repeatable experience. Customers value consistency and reliability. Brands help customers recognize and chose where they want to go. Reduces search costs, risks, Creates trust and sets expectations. Informal contract/agreement. Create a brand identity. What do you want to mean to your target customer? What differentiates you from competitors? Customer recall Fatigue - People don't remember more than 5+/- 2 brands at the same time. As a brand you need to be in the Top 3. To keep repeating, marketers need to successfully take new customer through the steps at least once. Use different terms, vernacular. Often contractual. Brands Reduce Risk - B2B side incredibly important. Market manager must understand who are the different customers who will buy the product in the introductory phase, and who later as the market matures. Word of mouth and usage by early adopters helps the rest mitigate/lower risk of trying their product themselves. Innovators (usually 2-3% of users) are quick to try new products because of self perceived status, feeling of being part of an exclusive community, the thrill/bragging rights. Usually useful for identifying bugs and issues with your products. Spend you time and focus on Early adopters (13-14%), who are opinion leaders, influencers and can get the rest of the market (early and late majority) excited. They are good at detecting the value of new product and how it would enhance their lives or their business. Same product can be in different stages across markets. E.g. Connected Thermostat is probably in early majority in the US, while, it is for innovators in India. Typical flow > Innovators try first and educate the early adopters. Visionaries then identify the benefit/value proposition and influence the early majority. Become profitable by serving the early majority with a high quality product and customer service. Gain late majority by reducing cost and price. Ignore the laggards. However, quite often, the flow is not smooth. The product could lose momentum in the gaps between the diffusion groups. To successfully cross the gap, follow the basics. Target the specific segment and develop a clear value proposition. Often times it is solving one highly specialized need for the early adopters, and solving a more broader wide appealing need for the early majority.